Since Thanksgiving is this week and I am going to be up to my eyeballs in turkey, ham and casseroles, I decided to make something totally different for dinner tonight. 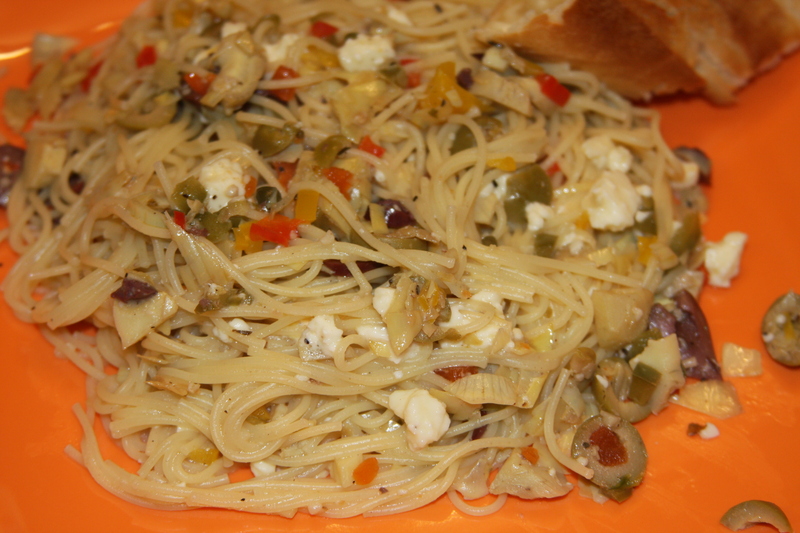 It has some great flavors of the Mediterranean mixed in with some angel hair pasta. I was a little nervous about how this dish was going to go over with my family. Some people around here are really picky and I often have to change up recipes to take out one ingredient and then add another in its place to make it edible for everyone around here. The pickiest eater is my daughter, who is 3. I will never figure out how a kid that lives in this house with all this amazing food I cook would prefer to not eat dinner and then eat cereal. I sometimes think about strapping her to her chair and force feeding her. But, then I think of all those therapy bills I will have to pay when she’s 20 and it takes all the fun out of it. The great news is that everyone loved it! Miss Picky Pants ate it too, though I did leave out the olives when I served it to her, she hates them. This is super easy to make and only takes about 20 minutes total. You can prep and get the other ingredients ready while your waiting for the pasta to finish. If you use angel hair, it only takes about 4 minutes to cook perfectly, it takes more time waiting for the water to boil. Especially if you sit there and watch the pot. This is a great meal for a weeknight when your short on time but want something great tasting and even healthy to eat. This is very inexpensive to make and shows that just because your on a budget, it doesn’t mean that you have to eat like you are! You could add some grilled chicken breasts to this and it would be wonderful. I just wasn’t in a meat eating kind of mood tonight, so I just did the pasta. This made about 6 full servings. ** For the gluten free version, just substitute the pasta for a GF version. Cook pasta according to package directions and drain well. Meanwhile, heat oil in large skillet over medium heat. Add pepper, oregano, thyme and garlic. Once pan is heated, add in artichokes and peppers and cook forabout 2-3 minutes to soften, stirring constantly. 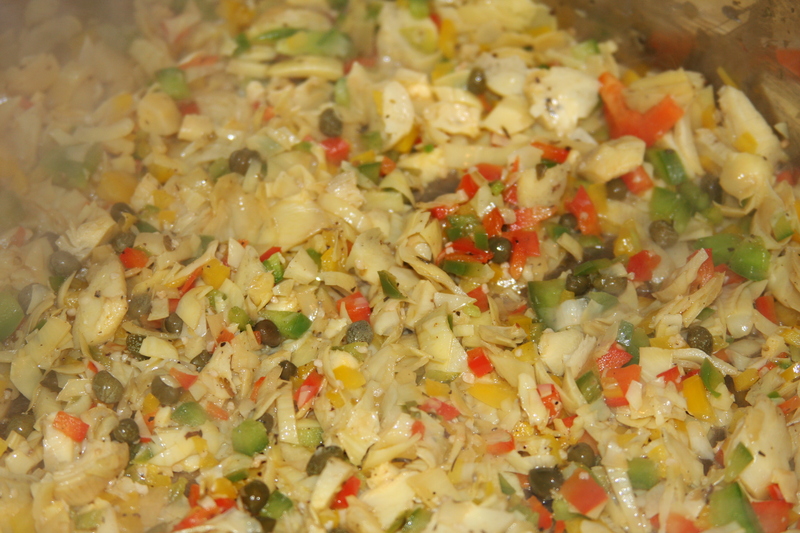 Add in your capers and olives and cook for another 2 to 3 minutes, stirring occasionally. Add broth and pasta to skillet, toss well and add in feta cheese. Serve with fresh bread. I used a baguette. 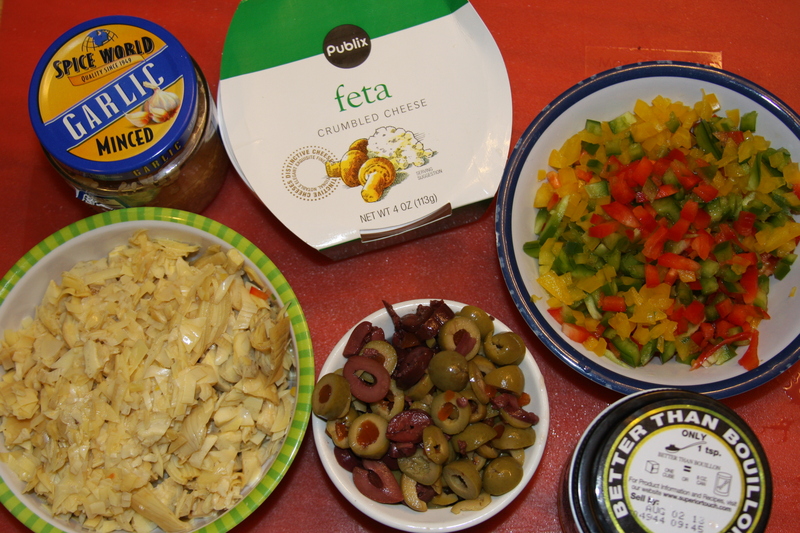 This entry was posted in Dinner, Gluten-Free, Lunch, Pasta Dishes, Recipes, Vegetarian. Bookmark the permalink.